Last year I did a post on Birds I Thought I'd Never See. Since then I have seen even more birds I thought I'd never see, so it seemed a perfect post to do again. some are new birds, and some are birds I did not include the last time for various reasons. It's one of the amazing things about birding to me, discovering new species, or seeing species that I once thought would be impossible for me to see. The bird in the above picture is one such species. I did not know if I would ever get out to the Pacific ocean to see a Pacific Loon. Well, as it turns out, I did not have to go to the Pacific because the Pacific Loon came to me and everyone else in Tucson AZ when it landed in a lake at Christopher Columbus Park earlier this year on the west side of town! The Rufous-capped Warbler is a totally different story. It is a species I did not know even existed and I would not have seen it if it weren't for Jeff and Dawn Fine from Birders Who Blog Tweet and Chirp inviting me to go hunting for it with them. Though I lived in Tucson at the time, and though I had heard of Florida Canyon, I had never been there myself. The Rufous-capped is known to frequent this canyon on a regular basis and we hiked up through the brush, climbed the dam and waited. Jeff went on ahead of us while Dawn and I hung out just above the dam and it was she who first spotted the small but colorful bird working its way up through the dense brush. We snapped away, all the time hoping that Jeff would get back in time to see the bird. He did. Since then Chris Rohrer and I have gone looking for it twice without any luck. This qualifies as "A-bird-I-did-not-even-know-I-wanted-to-see-but-I-am-sure-glad-I-did!" Owls. Who doesn't love them. Every birder I know has them on their list of species they most want to see. Most of the owls I have seen I have seen by accident, but the Mexican Spotted Owl ranks right up there with the snowy owl as a species I never thought I would see. But then my new birding buddy, Chris Rohrer, made it a must have species. I had read that this species could be seen in Miller Canyon in SE Arizona, but every description I read about Miller Canyon talked about how steep and rocky the trail was. Since I knew I would never attempt it alone, I figured I would never go and I would never see this species. I read the accounts of others who had made the journey and drooled over their photos, but decided that was the best I would ever be able to do. Then Chris took me there. And yes, the road up to the parking lot is rocky and bumpy with lots of wash-outs. And yes, the hike up was step and rocky, but it wasn't that far up, and when we found the owls it was amazing! Oh, and as for that other elusive owl? Well, I happened to be living in Massachusetts during the snowy owl irruption of 2011-2012. I saw this species several times, but this my my closest encounter on the beach at Sandy Point on Plum Island. Please realize that I took these photos with a zoom lens from a safe distance and the photos are cropped and enlarged. One must NEVER disturb an owl just to get a better photograph! Sparrows. We all love them and we all hate to identify them. Some sparrow species I have just given up on as species I will never be able to safely identify or see for myself. Clay-colored is one of them. It just seemed too tricky. But, then I found this sparrow mixed in with a flock of Brewer's Sparrows at Whitewater Draw in SE Arizona in January. I could tell it looked different than the Brewer's, but assumed it was a Rufous-winged due to what looked like two dark whisker marks or malar stripes along the sides of its throat. I initially reported it to eBird as such, only to discover that Rufous-wings are just as rare in Cochise County as Clay-colored sparrows. Then, another experienced birder from the area started to question me on my I.D. and a few other helpful birders chimed in. Photos were posted and in the end we realized that I had seen a Clay-colored sparrow! How do I know this is a Clay-colored Sparrow? Well, here is what I learned: It's a little bit more contrasty than a Brewer's, it has a gray nape, a striped crown with a central crown stripe, those two whisker marks, the pale beak, and while it has a line from its eye towards the back of its head, the eyeline does not continue towards its beak like it does on a Chipping Sparrow, a species with which it is often also confused when it is in winter plumage. Another bird I thought I'd never see is a Leucistic Vermilion flycatcher! I was not even looking for this bird when I saw it at Sweetwater Wetlands in Tucson in January of 2010. I was just going there to count birds for a Big January when I met other birders who were talking excitedly about it. As it was right near the entrance to preserve I did not even have to go looking for it. It just sat and posed for me! Leucism is when the pigment is not deposited in the bird's feathers for some reason. You can read more about it in the link I have posted below. Since I first became a better birder while living in the desert I learned mostly desert species before moving back east to Massachusetts for two years. While I now live back in Tucson it was a real treat as well as a challenge to see and identify shore birds and other sea going birds while living on the east coast. Still, there are groups of seabirds which are rarely seen from shore. Jaegers and Shearwaters are some of them. So it was absolutely amazing to me when I went on a birding expedition to South Beach in Chatham MA and saw my first jaeger. Jaegers are predatory birds related to seagulls. They will often chase other birds and try to steal their food, but sometimes they will actually kill and eat smaller birds and eggs. While they look somewhat similar to immature seagulls, they have more pointed wings and they usually have two long central tail feathers. This bird appears to have recently molted them. You can see the empty space where they should be. Not only did I get to see a Parasitic Jaeger, but I was able to see it involved in its predatory behavior of hunting a much smaller Forster's Tern! I must admit, I was rooting for the tern and it did get away! You would not believe how fast these birds were flying! It was one of the most amazing experiences of my life! When I first saw the above species at Revere Beach in Massachusetts, I did not even know what family group to put it in. I did not even know where to look for it in my bird guide! All I could do was describe it to my birding friends on Facebook who quickly directed me to the shearwaters. That is when I learned I had just seen a Manx Shearwater! They are known to hang out at Revere Beach and they classically turn sideways when they fly with one wing pointed towards the sky and the other pointed towards the water. I was just lucky to get a picture of one in this classic posture with an airliner in the background that had just taken off from Boston's Logan Airport! While I have lived on the East Coast and in the Rocky Mountain West, I have never lived in the Central Plains, so I just assumed I would not see many of the plains species. However, it was on a trip back from a visit to see my new grand-daughter in Kentucky that I stopped at the house of a friend in Oklahoma. T.R. took Gus and I birding in his neck of the woods and I was able to add yet another sparrow species to my Life List. This Harris Sparrow is much prettier in real life than in any photo or illustration I have ever seen. I had barely gotten my camera and started eBirding when I heard of a rare bird hanging out at a golf course in Casa Grande, AZ. It was Superbowl Sunday and we were on our way to go watch the Superbowl with my son, who lived in Coolidge, AZ at the time. Since Casa Grande was on the way I asked my non-birding husband to stop on the way north. It paid off when we found and photographed this Northern Jacana hunting along the edges of one of the golf course ponds. Until then I had never even heard of this rare tropical shorebird! Once of the most sought after species when visiting SE Arizona is the Scaled Quail. While I saw my first one on a Tucson Audubon outing to Whitewater Draw in 2008, I got this photo of one in a friend's backyard in Sycamore Canyon back in January of 2010. While doing research for this post I learned that they are also called "cotton-top" quail! Until this year, the Rosy-faced Lovebird was high on my list of bird species I thought I would never see. This species I had looked for before when birding at Gilbert Water Ranch in Gilbert AZ. Every time I went there I would look for this bird. I would meet other birders who saw it on the same days, but this bird eluded me...until this year. It was on my birthday when my husband and I went to the Phoenix Art Museum first, then stopped by a nearby park where the species is roosting and nesting. We walked up and down the street looking for the bird without any luck. I thought I was going to miss out once again. The sun was starting to set and we were heading back to the car when I heard a strange call. I focused in on some palm trees at the corner of the park and there it was! What a perfect birthday present for a birder! It made my day! 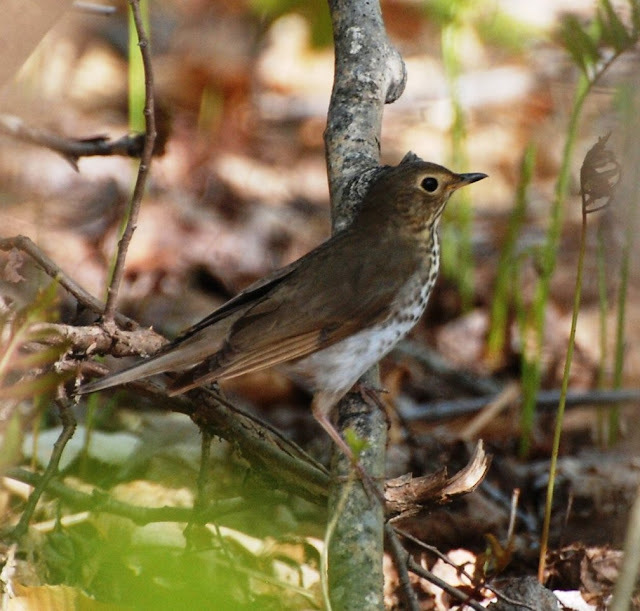 When I was in Maine in May of 2011 I never expected to see and photograph a Swainson's Thrush in my in-law's backyard! This is why Birding is Fun, because there are birds everywhere, and often in unexpected places! Hopefully by this time next year I will have more birds to report that I thought I would never see! Congrats, Kathie, on all those new birds! Fantastic photos! Hilke, sometimes I am amazed at all the birds I've seen! Thank you! What a great set of sightings you've enjoyed. Wonderful photos! Especially loved your scaled quail view and harris sparrow. Debbie, they are beauties, aren't they? Thank you! Wow, great series of bird photos! Hey Kathie, great list and great photos. It is amazing how quickly birds go from being just dreams and wishes to possibilities to realities, sometimes with only a little travel or the input of another birding buddy. TheAnd each day, each new outing, brings that possibility again and again! Laurence, yes it is, and sometimes I feel as if I am in a daze when I see them for the first time! Wonderful photos, Kathie and congratulations on all the lifers. I have seen only three of the species you've listed! Ah, Prairie Birder, and which ones would they be? Perhaps Harris and Clay-colored sparrows and the snowy Owl? One day you will see more, I just know it! Chris, we do live in a unique place rich in birds and wildlife! such a wonderful smorgasbord of beautiful birds. When I saw the rosy-faced lovebird it appears what we would call the Peach-face lovebird years ago (maybe still). Carole M. Yes, it did use to be called the Peach-faced Lovebird but a few years back the American Ornithological Union (AOU)decided to rename it. They do this stuff all the time and we birders just have to roll with the punches! The American Wigeon used to be called a "Bald Pate." I like the old name best as it best describes the bird, but no one asked my opinion when re-naming it! Wow, you've got quite a list here. Terrific post, Kathie! It's always a thrill to come across a bird not common to your area. I really like the theme that you have chosen for this post. Wonderful photographs! Here's hoping for many more "birds I thought I'd never see" moments in 2013. Julie, Yes, I do hope to add to this list for next year, LOL! Thanks!